Making clothes for tiny bears can be a challenge. Non-fray fabrics such as felt are often too bulky, and thin cotton and silk tend to fray. It used to frustrate me no end, especially since I have a wonderful stash of vintage cotton fabric with small motifs. A friend who makes doll clothes taught me this method for working with fabrics that fray - simply double it up! This means no more working with fiddly linings around the neck and armholes. Clothes that are made this way are robust enough that children can play with it. To start, you will need a paper pattern. 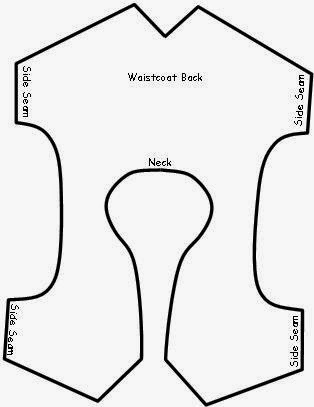 I designed the pattern for a waistcoat for Angus the same way that we made the bolero pattern in Week 15. If you don't want to draw your own pattern, you can use mine, you will find the the template to print HERE. Fold double the piece of fabric that you will use for the waistcoat, with the right sides inside, and pin together so that the fabric layers won't move. Trace the pattern on to the fabric. (I used calico to make a sample waistcoat so that you can see the steps more easily. 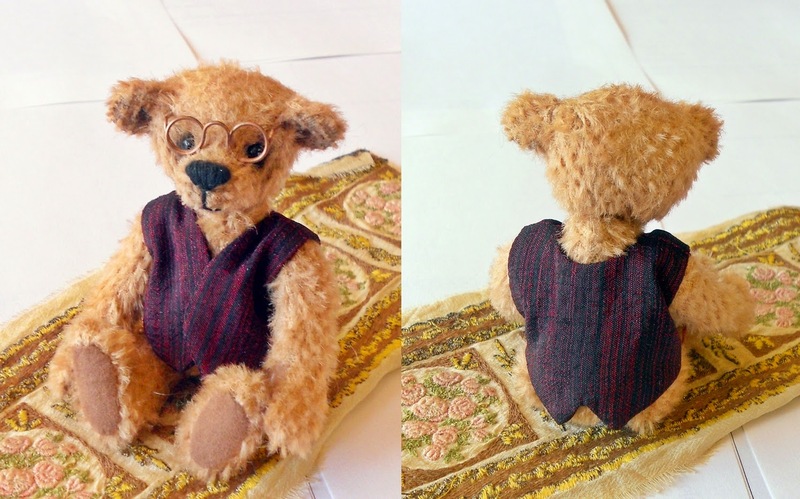 My Angus waistcoat is made from burgundy silk with a fine black stripe, it would not photograph!). The template lines are the sewing line. This makes it easier to sew the seams accurately. The seam allowances still need to be added on so don't cut the waistcoat from the fabric yet. I stitched my waistcoat on the sewing machine, but you could do it by hand. Leave the side seams open. Once all the seams are sewn, cut out the waistcoat, leaving a 2-3mm (1/16 inch) seam allowance. Clip the curves and corners. The side seam openings can be fray checked, and a very thin line of fray check applied around the neckline and on the corners if you are concerned that the fabric might fray when turned right side out. Carefully turn the waistcoat right side out. I found it easier to turn it working through the side seams on the back of the waistcoat. Use a hemostat or long tweezers. Press the seams flat. If your waistcoat needs ironing, now is a good time to do it. Fold under the raw edges on the waistcoat side seams, front and back. At this point your waistcoat does not have a right side and a wrong side, unless you used different fabric for the lining. Fold the waistcoat at the shoulder so that the front and back side seams match up under the arm hole. Whipstitch together the two inside layers of the side seam. Ladder stitch or whipstitch the two outer layers of the side seam together. Repeat for the other side of the waistcoat. Next time we will add hand made buttons. My book page for Lesson 15. In this miniature bear making series, we are using the Angus pattern, which you will find in my Etsy Shop, and on the Tin Soldiers Website. Every week, you will find printable templates for Project 52 HERE . What a sweet bear. He looks very pleased he has a new waist coat. It certainly is much easier to do it this way.